www.settledowncabins.com Rustic Vacation Cabin Rental in Hocking Hills. A vacation area known for cliffs, gorges, rocks, caves, shelters, and waterfalls. In many cases we forget to rest and reconcile with (God, family, friends, etc.). We must learn to refill to continue to operate in our purpose. SDC offers facilities Just 4 Rest! Jesus Feed the Five Thousand – Mark 6:30-32 The apostles gathered around Jesus and reported to him all they had done and taught. 31 Then, because so many people were coming and going that they did not even have a chance to eat, he said to them, “Come with me by yourselves to a quiet place and get some rest. 32 So they went away by themselves in a boat to a solitary place. On The Same Day At The Coshocton Ohio Fairgrounds! PIANO & VOICE LESSONS-GREAT PRICES! Attend praise and worship conference events and concerts! Please visit: http://newsoundmusicgroup.com/ OR call 614-859-2029 TODAY! 15. HELP HOTLINE/BUSINESS DIRECTORY 16. Where Will You Go When You Die? Trust God Even In Bad Times, God Will Not Leave You, So Don’t Leave Him! Visit Edwin Channels Website Today! He said “The man just went past the bar and is going back in the direction we brought him from. The Power of God kept him out of that bar!” At that time I looked in my rear mirror and saw the man going down the road. Guess what he was doing! He was shaking and bending that leg that had been damaged for 18 years. The power of God set Him FREE! God sent a man 500 miles, to pick this fellow up and pray for him. That's the love and power of God. www.step-by-step.org or jim@step-by-step.org GOD LOVES YOU, YES YOU! & HELP ME GOD! 2 New Book Releases By Tamara Cornelius SEND YOUR DONATION WWW.SWMMAG.COM TO GET YOUR COPY TODAY! never taken money for ourselves from any offerings or tithes, we have always put any money back into our ministry when people do bless us to put gas in our van to keep moving, also for us to have food to eat while on the Change The World Tour. That is the only way we can survive, eat, get gas to travel, and have the hotel to stay wherever we travel. It’s only by God allowing people to bless us with the money to keep our ministry going forth. Even though God has us full time for His work, we DO NOT take up offerings on tour or ever sell magazines or Bibles, we give them away for free! 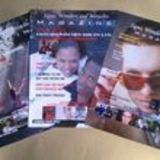 Once in a while people give donations to help us print magazines, or to give towards the outreach tour, this way people will know Gods love and His awesome miracles. It’s cheaper to drive our van to places we minister to. Our van took a beating on the road and many miles of wear to the point we came back to Columbus to get repairs done. God also knew Alan was getting tired of all the driving, so God told someone to remain nameless and to give us the money towards getting my airplane ticket to get back to Georgia to tell about Jesus on a television show, and to continue the tour for many who still need to know about the love of God. Time and time again, God has not failed us. God always makes a way! That money was a miracle from God! When we started on tour, we didn't want to be burdened with huge bills and mortgage payments while on the road ministering. We didn't want to get another house until the tour was close to the end. Even though we are not done touring yet, God blessed us to own a new home, and have payments so low that we can still be on tour and not be trapped with big bills. When our first house was about five times more! To go from paying big payments monthly on mortgage, to now only a few hundred dollars a month to own a home is a blessing from God! God continues to do miracle after miracle. He’s not done, He wants to do miracles in your life also. What did God tell you to do? GO FORTH IN JESUS NAME! Trust and obey, God won’t fail you! one in a lifetime experience. You can honestly be in His presence like I was every single day in your own home if you only repent and surrender to the Lord God Almighty and ask God to give you this new amazing life here on earth, but not only that! Eternal life with God is free, and that is only found through His Only Begotten Son Jesus. Worship God and turn from your sins. Praise God and ask Him to fill you with His Holy Spirit. I am a living witness that God is real! God answered my prayers and I have never been the same since that day! On that very first day at that church, when I got off of that floor and went back to my seat, as I was sitting there my friend said that the Lord had revealed something to me that I need to tell you. That you will be a witness to others and minister, and sure enough four days later I witnessed to a lady at work. Through the years there has been many people that I am able to speak to about our Lord. I share the joy that God has given to me to others. I am so very blessed. My very special scripture is The Lord is my Shepherd and I shall not want. From Psalms 23 verse 1. I kept going every Sunday after that. God changed my life for the better and now it's been 5 years that I've been at the same church, and walking with Jesus. Before I heard God's voice telling me to go to that church, I was broken in my heart. Every since that day I felt God's presence in that church though, my life is full of joy and the peace of God. I am on the worship team, I've been saved because of what Jesus has done for me when He sacrificed His life for me. I've been baptized in water, and also baptized in the Holy Spirit with evidence of speaking in tongues. I pray over others like the Bible teaches. I keep letting God use me in mighty ways for His glory. I am here to serve you Lord. Have faith believe and know that God is with you wherever you go. Blessings to all his children. Short testimonies from those who have seen God move in their lives! got a message to let him know that one of the homeless men from the beach had passed away. This one homeless man that John led to the Lord four months prior, he was very much loved in that town after he had became a Christian. He ended up preaching the gospel to all the people on the beach after John had left that town. His funeral ended up on the news in his hometown because of the impact that man had made in that town after John led him to Jesus. About 15,000 people came to funeral when that homeless man died. How much of an impact can you leave for God? You will never know how many people will make it to heaven because of God using YOU! 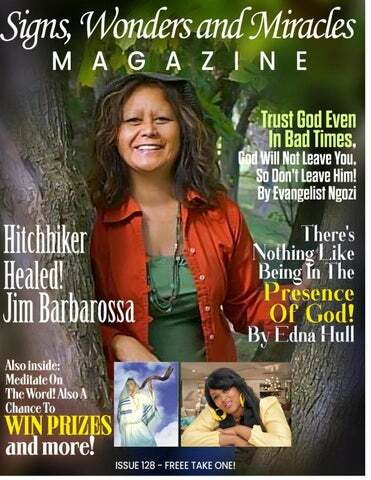 God Sets the Captive Free by Jim Barbarossa We received a call a few days ago from a man that manages one of the Free Public Access TV stations we air on. He said that his brother had been addicted to heroin for 10 years. That he had tried everything to help him. He said about 2 months ago his brother watched a Step By Step Ministry TV program on the subject of healing. During the program God set him free from heroin and he has been clean for 2 months. Thank you Jesus! "The Anointing Breaks the Yoke" Healing miracle! I was in so much pain on the last week of August. My back and right shoulder was getting worse. It even hurt to lift my right arm. I was praying to God about it as I cried to Him wanting relief since I missed my doctor appointment. It was then that God heard my cry and healed me! I came down the stairs full of healing and joy! Trust God and do not doubt! CALL US TODAY! 614-203-0920 Or Send your donation! We do accept Credit Cards now online through Paypal! God Wants You To Know That Heaven Is REAL! John 14:1-3 Let not your heart be troubled: ye believe in God, believe also in me. 2 In my Father's house are many mansions: if it were not so, I would have told you. I go to prepare a place for you. 3 And if I go and prepare a place for you, I will come again, and receive you unto myself; that where I am, there ye may be also. face of my Father which is in heaven. 11 For the Son of man is come to save that which was lost. Revelation 20:10-15 And the devil that deceived them was cast into the lake of fire and brimstone, where the beast and the false prophet are, and shall be tormented day and night for ever and ever. 11 And I saw a great white throne, and him that sat on it, from whose face the earth and the heaven fled away; and there was found no place for them. 12 And I saw the dead, small and great, stand before God; and the books were opened: and another book was opened, which is the book of life: and the dead were judged out of those things which were written in the books, according to their works. 13 And the sea gave up the dead which were in it; and death and hell delivered up the dead which were in them: and they were judged every man according to their works.14 And death and hell were cast into the lake of fire. This is the second death.15 And whosoever was not found written in the book of life was cast into the lake of fire. Revelation 4 After this I looked, and, behold, a door was opened in heaven: and the first voice which I heard was as it were of a trumpet talking with me; which said, Come up hither, and I will shew thee things which must be hereafter. 2 And immediately I was in the spirit: and, behold, a throne was set in heaven, and one sat on the throne. 3 And he that sat was to look upon like a jasper and a sardine stone: and there was a rainbow round about the throne, in sight like unto an emerald. 4 And round about the throne were four and twenty seats: and upon the seats I saw four and twenty elders sitting, clothed in white raiment; and they had on their heads crowns of gold. Luke 16:23-24 And in hell he lift up his eyes, being in torments, and seeth Abraham afar off, and Lazarus in his bosom. 24 And he cried and said, Father Abraham, have mercy on me, and send Lazarus, that he may dip the tip of his finger in water, and cool my tongue; for I am tormented in this flame. Matthew 10:15-17 Therefore are they before the throne of God, and serve him day and night in his temple: and he that sitteth on the throne shall dwell among them.16 They shall hunger no more, neither thirst any more; neither shall the sun light on them, nor any heat. 17 For the Lamb which is in the midst of the throne shall feed them, and shall lead them unto living fountains of waters: and God shall wipe away all tears from their eyes. WHAT IS THE GREATEST FREE GIFT? BUSINESS & WEBSITE DIRECTORY NEED WORK ON YOUR CAR? Coshocton Ohio area, please contact Logan Eddy 740-722-9467 for great work on your car for a great price! Oil change, disk brakes, motor work, motor replacement, transmission replacement, axles, ball joints, and more!!! VACTION CABIN RENTALS IN HOCKING HILLS! FACILITIES  The Cabin is situated on 5 acres and sleeps 4-6 The Cottage sits on 80 - acres of wooded property and sleeps 6-8 Both facilities include hot tubs, indoor plumbing, stove, refrigerator, beds, linen, TV, etc. Check availability, Pricing, and Make reservations on-line at: www.settledowncabins.com A vacation area known for cliffs, gorges, rocks, caves, shelters, and waterfalls. In many cases we forget to rest and reconcile with (God, family, friends, etc.). We must learn to refill to continue to operate in our purpose. DO YOU NEED SOMEOME TO LOOK OVER YOUR CONTRACTS? WWW.THE SHOFARMAN.COM ALSO VISIT WWW.STEP-BY-STEP.ORG Please Visit our websites for evangelism tools and Shofars as well as Worship Dancer clothes and flags! Read Both Magazines Online TODAY! WHERE WILL YOU GO WHEN YOU DIE? Let’s face one of The biggest questions that most people have. If you died this very mome nt, where would you go? What if moment, Jesus came back this very moment, would He take you with Him to Heaven? Tomorrow’s not promised to no one! If you never had a relationship with God, what are you waiting for? It’s not about religion it’s all about a relatio nship with God. He relationship has been waiting for you. If you don’t know how to talk to God, here is a short prayer that can help lead yo you: u: Dear Father God, I am a sinner and I need your help, please forgive me! I do believe that you sent your only Begotten Son Je sus here to die for my sins. I believe in my Jesus heart that you raised Jesus from the dead and He sits at your right hand in heaven. I accept Jesus as my Lord and Savior. Thank you for loving me. I surrender my life to you Lord, fill me with your Holy Spirit aand nd change me to be what you have called me to be. In Jesus’ name, Amen.